As usual, express (yet balanced diet) home-cooked dinner for our weekday. I planned tonight’s dinner since last evening. Saw the frozen pork chops and mixed peas in the freezer before I cooked dinner last evening, I knew what will be my tomorrow’s dinner then! I cooked extra rice for that night, ready to reserve the extras in the freezer overnight. What else? 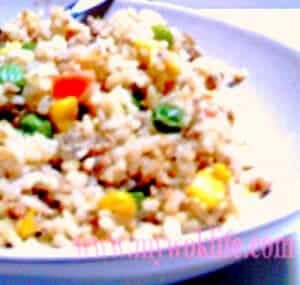 Fried rice with pork chop meal is the best option for tonight’s dinner! 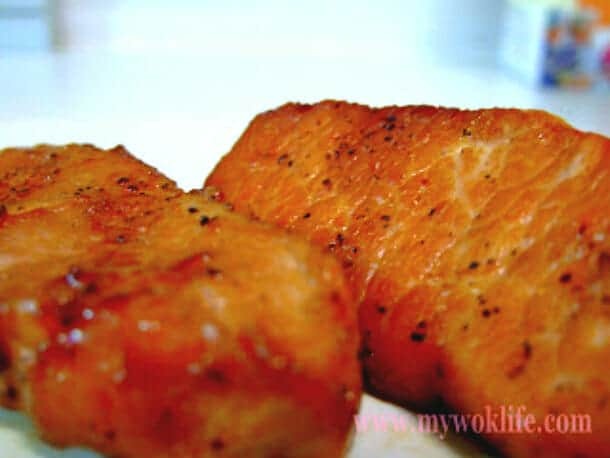 The recipe used here is good for both pan frying and baking methods. Time is manageable here. Dinner for 4 will surely be ready in 65 min! Sorry… Tonight’s recipes were quite a “heavy loaded” one – 1 plate of fried rice counts 450 kcal. Plus 1 thick chop about 170 kcal or 2 thin slices at about 140 kcal. The only way to help is, to use less oil to fry the rice. 1) Place pork chops in large bowl. Season well with soy sauce, oyster sauce and rice wine (Make sure sauce cover all sides). Sprinkle pepper on both sides of chops. Marinate for 15 min. Set aside. 2) Heat up a wok with high fire and add 2 tablespoons oil. When the oil is hot, add the eggs. Stir-fry, until lightly scrambled (and not too dry), break the eggs into small pieces. Remove the eggs and reserve for later. 4) Return to fried rice: Heat up the wok again with high fire. Add 2 tablespoons oil. Add garlic and onion, fry for 30 seconds, till fragrant. 5) Reduce heat. Add frozen peas and stir-fry for 2 min. Add the rice. Use a wooden spoon to break up the rice. Continue to stir-fry for 3 min. Stir in salt, pepper ad soy sauce. Tossing often, till well combined. Lastly, add in chinese wine. Stir-fry for another 1 min. When the rice is heated through, add the fried eggs back into the wok. Mix thoroughly. Ready to serve with pork chop. 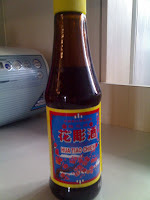 Tips:Chinese Shao Shing Hua Diao Wine, I used Plum Blosson Brand (梅花牌) which costs $9.80 per regular bottle from supermarket. This is a better grade of Hua Diao Wine. Its taste is much more fragrant as compared to those $1 – 2 per big bottle type of brands, very easily differentiate their frangrance & taste quality, seriously. Use this chinese wine to add frangrance to your fried rice or fried vegetables. *Reduce the amount of light soy sauce and oyster sauce to 1 tablespoon each for seasoning of pork chops, if you intend to marinate overnight. Hi there, is there any non-alcohol alternative to the rice wine? Appreciate your kind advice. Thanks! If rice wine is not an option to your cooking, you may omit it. Otherwise, the closest alternative I could think of for this particular recipe is Worcestershire sauce.